thanks for the photo, looks cool, never seen it. the V II that I've seen photos of, and I believe it belongs to the fillmore guy, is white with a Moseley tp, this one obviously has a vibramute. If this was built in the 90's, it's the only remake from that time period with correct(at least correct looking) pickups. If Semie made this, he obviously had some parts lying around to assemble it, Andy Moseley may have even had some of these pickups. When I visited Loretta back in 97, she had at least one early V II tp and a couple of very warped V II necks. All of the V II copies I've seen from the 90's are made to look like Johnny Ramones, not like this one. Does anyone know where this came from and who owns it? It's only a guess on my part that one or more may have had a vibramute from the factory, entirely possible, just haven't seen one. As for the one with the Moseley. maybe the owner put it on himself, mine has a solid Moseley tp on it now. I'll probably put the original back on soon. Every Mark V I've ever seen has a short scale, the Ventures II's, both versions, do not have a short scale. That is the difference, besides the obvious differences. Whoever has a Mark V out there, measure the scale and post it, I'll measure my V II later and post the length. I was under the impression that the old ventures 2 slab guitars and the redigned version had the same scale length. can anyone else confirm is rocco is correct about this? I can tell you for certain that the Slab Body Ventures II and the German Curved Body Ventures II both have the same scale length neck (from the center of the zero fret to the center of the twelfth fret is 12 inches)... This is also the same scale as the regular Ventures model (Mark I). There are two differences between these necks, but the length isn't one of them. The head on the Slab guitar is narrower by 3/8's of an inch, and the bottom of the neck (where it meets the body) is rounded off on the corners. But both fret boards are the same length and width. Now I can't speak for when they changed from Ventures II to The Mark V, this is where someone with a Mark V needs to step in. I know johnny had one sooo they must have made more than one unless artie's is originally johnny's???? No, Those are two completely different Mark II models. I haven't seen many sunburst mark II models though, These may be the only two I've ever seen. Well here goes.....ten years ago I bought a Ventures II for $120.00. No decal, thin headstock, moseley tailpiece, looks like someone either sanded the german carve or just rounded off the slab. No electronics. serial # B174...neck date August 1965.....I am refurbishing it right now...but, can anyone verify if it is a slab or not. Thanks. johnnyboy1234 wrote: Well here goes.....ten years ago I bought a Ventures II for $120.00. No decal, thin headstock, moseley tailpiece, looks like someone either sanded the german carve or just rounded off the slab. No electronics. serial # B174...neck date August 1965.....I am refurbishing it right now...but, can anyone verify if it is a slab or not. Thanks. He posted some pictures of it somewhere else on here. I can't remember exactly where, though. 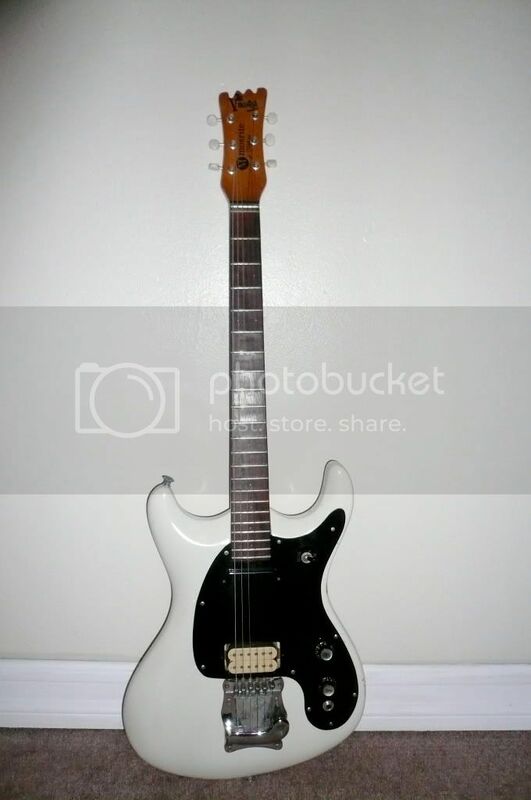 Is this the guitar in question? Yes, I do believe that is it. I don't think that's an original Ventures II body. I could be wrong, if it is it's been heavily modified. Aside from the adges being rounded off and some sort of a "German Carve" the neck is set really far into the body. On a Ventures II the neck is into the boy to about the forth fret from the bottom, that neck is set in much more than that. I would be interested in seeing a photo of the back of the guitar where the neck meets the body. 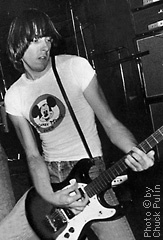 Could be a Melo-Bat body, or a non Mosrite Body.